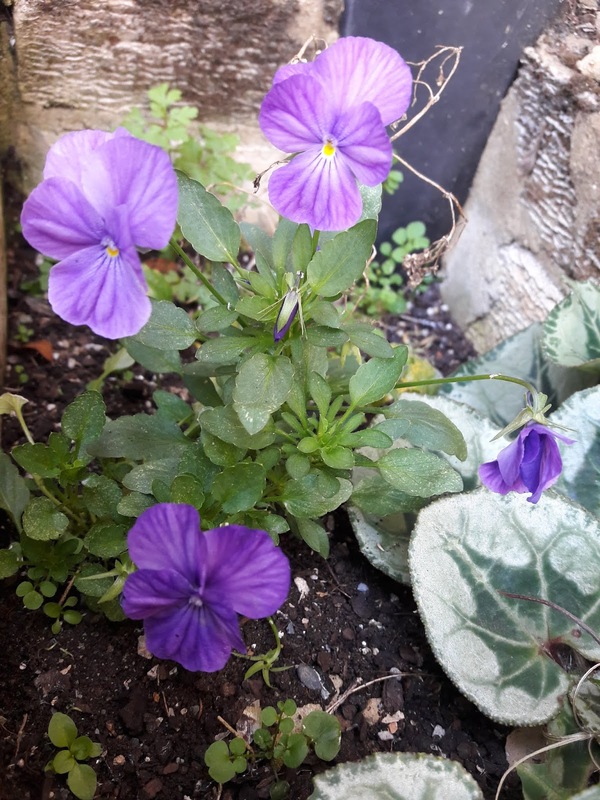 Eighteen months ago I wrote about some unlikely flowers growing out of a drain by my office. This 'little splash of colour and loveliness' was caused by deep red cyclamen, which withered, died and then re-appeared several months later, brightening up both autumn and spring. Raggedy-looking they may be, but they are also extremely hardy, somehow flowering despite a complete lack of care and attention from any gardener, and only rain, whether a brief shower or a sustained downpour, to water them. But just as their appearing has been somewhat random and unexpected, so too their disappearing - or rather, their giving way. For the past couple of weeks I've been gazing down almost daily at these violets nestling in the space behind the cyclamen leaves, delighting as much in their unexpectedness as in their existence. Violette have a special place in my heart and memories, such that they occupy the masthead of this blog; heart's ease and tough survivors, as I explained a few years ago. Heart's ease was my first thought when I saw them; a simple, uplifting sight as summer comes to an end, and so much else in the world feels out of kilter. But this morning I was reminded of the Victorian publication The Language of Flowers, and after a little search I came across a reference to the significance of purple violets - that they symbolise that the giver's thoughts are occupied with love for the recipient.